In reading this history of the Global Consultation on Music and Missions (GCoMM) it will become apparent that this meeting was not birthed through the effort of a single individual. Its initiation was prompted by God’s Spirit through a consensus of several music/arts specialists. GCoMM can trace its roots to several sources. The idea of a meeting of music missionaries and others involved in sharing the Gospel cross culturally through the arts was a long-term dream of T. W. Hunt, professor of church music at Southwestern Baptist Theological Seminary (SWBTS). He had begun teaching courses on music and missions at SWBTS in 1967 and was a mentor to music missionaries around the world. The Summer Institute of Linguistics’ (SIL) ethnomusicology team invited musicians to gather on various occasions at their base in Dallas. An annual retreat for missionary musicians was held in Nashville for several years. In the mid-nineties the AD2000 Movement organized a global network focused on Worship and the Arts appointing Frank Fortunato, International Music Coordinator with Operation Mobilization (OM), and Byron Spradlin, President of Artists in Christian Testimony (ACT), to lead this effort. Almost 1000 delegates registered at this booth, many of them realizing for the first time that they could use their artistic skills in the missionary endeavor. The more recent impetus for creating GCoMM began at Urbana, 2000. Spradlin rented a booth through ACT and invited other ministries involved in the arts to share the space and expense. Seven groups or individuals joined Spradlin. Almost 1000 delegates registered at this booth, many of them realizing for the first time that they could use their artistic skills in the missionary endeavor. Building on this interest by so many young people Frank Fortunato circulated among the various Urbana booths inviting those exhibitors that made any mention of the arts to an impromptu breakfast. The initial focus of the breakfast besides networking was to discuss the next step for the International Worship and Arts Network since the AD 2000 movement was being phased out. Among those present at the meeting were John Benham, John Bowers, Frank Fortunato, Roberta King, David Lanning, Ron Man, George McDow, Paul Neeley, Byron Spradlin, Paul Warnack, Steven Whang, and Jolene Wilson. 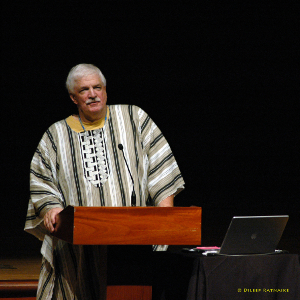 The attendees encouraged Frank Fortunato to continue his Global Worship Report, an e-mail newsletter, and expressed a desire to organize a conference focused on missions and the arts. Over the next few months several people from the Urbana meeting continued to correspond about the possibility of holding a specialized conference. One such discussion occurred in February of 2001 when Spradlin and McDow, a music consultant working in Asia at the time, met in Nashville to talk about cooperating on some overseas projects. During that week they linked up by telephone with Frank Fortunato and restated their interest in organizing a gathering. In late spring of that same year McDow met in Fort Worth with both Tom Avery, International Ethnomusicology Coordinator for Wycliffe, and Stan Moore, then church music chair at SWBTS, both former music missionaries to Brazil. Avery and Moore had been discussing such a meeting for over a decade and felt that SWBTS with the support of Wycliffe could host a conference. Within a few months they had begun to gather a planning committee. The name Global Consultation on Music and Missions was chosen and John Piper was engaged as the plenary speaker with Harold Best as the conference moderator. In September of 2003 the first consultation was hosted at the Fort Worth campus of SWBTS with over 300 people in attendance from more than twenty countries. The results of the first gathering (GCoMM 2003) were overwhelming. Many of the participants felt it was an “event of a lifetime” and that the plenary sessions and numerous seminars were outstanding. Many also shared that the highlight of the event was the opportunity to interact with the attendees, expressing their thrill at finally meeting people with whom they had only corresponded. During the meeting the International Council of Ethnodoxologists (ICE), a worldwide network for those involved in cross-cultural arts ministries, was launched. By 2004 committees were being formed to initiate another GCoMM. The executive committee accepted an invitation from Benham’s Music in World Cultures organization to host the event in July, 2006, at Bethel University’s Saint Paul, Minnesota, campus. After the 2006 consultation, the executive board decided to take GCoMM outside of North America. 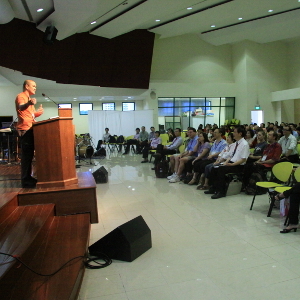 Singapore was chosen as the first overseas venue with Joseph Lee as the organizer and both Bartley Christian Church and Singapore Bible College as sponsors and venues. Over 300 registrants attended with approximately 1,000 present at each of the open evening sessions. Michael Card served as the keynote speaker/performer. In 2015 the fourth GCoMM was held in Chiang Mai, Thailand. Payap University and the Christian Communications Institute helped with organizing the event as did Southeast Asia Marketing (SAM). George McDow served as planning committee chair, and both Ann Zaki and Samuel Chiang were plenary speakers. Some 40 countries were represented. Plans are now being made for GCoMM 2018 to be held in Kenya, Africa.